Plot: It’s Christmas Eve in Bedrock and the Flintstones and Rubbles are finishing up their preparations. Wilma (Jean Vander Pyl) and Betty (Gay Hartwig) try to persuade Fred (Henry Corden, taking over the role seamlessly from the late Alan Reed) to play Santa at the orphanage’s Christmas party that night, but Fred refuses and heads to work. When he arrives his boss, Mr. Slate (John Stephenson) informs him that his wife wants Fred to play Santa for the same party. This time, to protect his job, Fred agrees. At home, Fred and Barney (Mel Blanc) prepare for the party, but hear a thumping from the roof. They find Santa Claus (great voice actor Hal Smith, who played Santa in no less than five different cartoon series over the years) in the snow. Although Fred is skeptical at first, Barney finds the sleigh and reindeer, proving they’ve got the real Santa in the Flintstone house. Santa sprained his ankle on Fred’s roof, and Barney suggests Fred as a substitute while he heals. Santa gives them a dose of magic and sends them on their way. Things go relatively smoothly for Fred and Barney’s first few deliveries, but some turbulence knocks the sack of presents out of the sleigh. Barney calls Santa on the sleigh’s CB radio (it was the 70s, people), and Santa tells them to go back to the North Pole for another load. As they wait for the sleigh to be reloaded, Fred and Barney take a tour of Santa’s high-tech operation and pitch in making some toys. They get back in the air and speed up their deliveries, realizing Fred is still scheduled to play Santa for the orphans. Back in Bedrock, the children are starting to get upset – almost as upset as Mr. Slate. Fortunately, Fred and Barney finally arrive, spilling in through the chimney with such a spectacular entrance Mr. Slate forgives their tardiness… until Fred realizes they’ve given out all the presents already. With a little of Santa’s Christmas magic, Fred produces more, and the children are overjoyed. As they open their gifts, the boys return home to send Santa on his way. Wilma and Betty return home, angry at their husbands for rushing out of the party, and Santa ducks out before they see him. Although the girls don’t believe Fred and Barney’s story about filling in for Santa, they forgive them and begin trading gifts. Fred is horrified to realize, in all the commotion, he didn’t get Wilma a present, but Santa saves the day one last time, slipping one down the chimney. Pebbles and Bamm-Bamm spot Santa flying away, and their fathers join them at the window, waving goodbye, while the girls just chuckle at the four kids looking up at the skies over Bedrock. Thoughts: Like Fat Albert, this 1977 special takes characters from a popular cartoon show and gives them a Christmas adventure, although unlike Fat Albert, by 1977 the original run of The Flintstones had been over for several years. Fortunately, with animation, it’s easier to do a reunion special without worrying about actors getting older or passing away or refusing to reprise their role – in almost every case, a new voice artist is always a possibility. This special managed to get most of the original voices back, but one wonders if Mel Blanc felt a little confused that he was remaking a cartoon he’d done 13 years prior. A Flintstones Christmas borrows much of its plot from the 1964 episode of the TV show, “Christmas Flintstone” (brilliantly clever with titles, these Hanna-Barbera folks), specifically the story of Fred filling in for Santa Claus after he injures himself. This special adds in more and different music and ages the children – Pebbles and Bamm-Bamm are elementary school age, whereas they were still babies in the original. They also trade out B-plots – in the original, Fred was working as a department store Santa for extra money, whereas here he’s dealing with Mr. Slate and playing Santa for orphans. The B-plot is used to give urgency to the A-plot as well, while in the original Fred was pretty much done with his gig when he stumbles into the real Santa and is called upon to fill in. Still, if one were to sit down for a marathon of the assorted Flintstones Christmas specials and episodes throughout the years (something a guy like me is honestly very likely to do), you’d be a bit shocked when you essentially saw the same show twice. Having dealt with that particular elephant in the room (I’m going to ignore the one about characters celebrating Christmas before the birth of Christ), let’s talk about the story for what it is. The notion of Fred filling in for Santa is a wonderfully natural one – the heart of the character is that of a sort of good-natured lummox. For all the times throughout the years where Fred gets short-tempered or angry, at the core of the character is a deep, abiding love for his wife and friends, the sort of thing that lends itself perfectly to playing Santa. The actual mechanism for getting him into the suit was pretty clever for the time, although it seems that Disney picked at this cartoon when they made Tim Allen’s more morbid The Santa Clause. Although there was music in the original version of this, this version has much more of it, almost making it into a full-blown musical as both Fred and Barney break into song about how much they love Christmas at assorted points in the show. While none of the music has broken out and become of particular note, it’s perfectly passable and a nice addition to the cartoon. The animation style is really indicative of the sort of thing we got from Hanna-Barbera, up to and including a nice little Rube Goldberg-style montage sequence in Santa’s workshop, where Fred and Barney spill out onto the conveyer belts and get temporarily caught up in the mechanisms of the toymaking machines. We saw this sort of thing a lot in the old Hanna-Barbera cartons, second only to the “hall of doors” chase scenes they did so often, particularly in Scooby Doo. 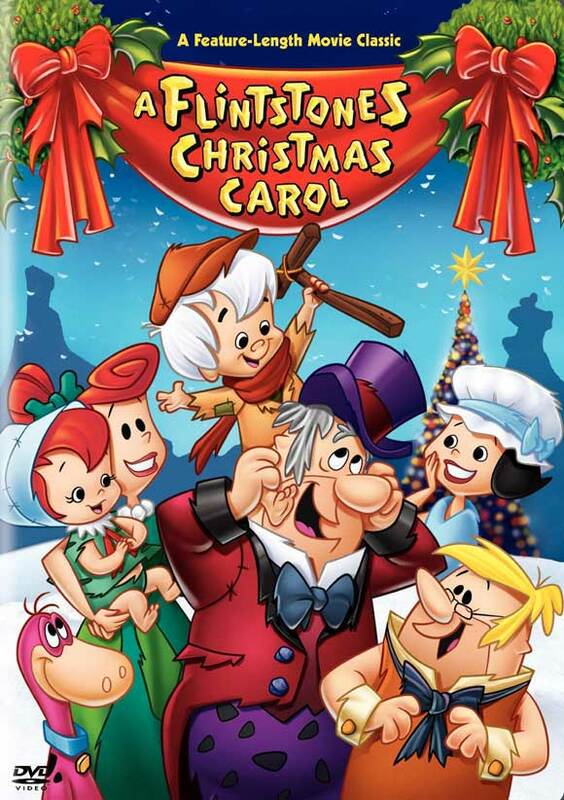 In terms of sheer volume, the good folks at Hanna-Barbera may have been second only to Rankin and Bass for producing great Christmas cartoons. However, there aren’t a lot of ‘em I could use for this project, as so many of them are feature film length, regular episodes of assorted TV shows or, saddest of all, not available on DVD. Maybe next year. But for now we’re not quite done with the Hanna-Barbera characters… not yet.